On Monday 2 November 2015 we had an impressive display of the Vienna State Opera's adoption of the latest UHD technology for their Wiener Staatsoper Live at Home video streaming. At the residence of the Austrian Ambassador in London's Belgrave Square, the director of the Vienna State Opera, Dominique Meyer, introduced us to their 2015/16 season and then we were treated to a sample of their UHD recording of Nina Stemme in Sven-Eric Bechtolf's production of Richard Strauss's Ariadne auf Naxos. 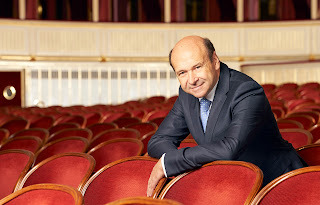 The Vienna State Opera already has a live streaming service, Wiener Staatsoper Live at Home, and some 45 operas are planned for 2015/16 ranging from Edita Gruberova in Donizetti's Anna Bolena, through Adam Fischer conducting Wagner's Ring Cycle to Thomas Ades' The Tempest. The UHD transmissions will be included in this offering. Of course to appreciate it properly it does require the right equipment but the aural and visual results are stunning. And they go a long way towards Dominque Meyer's desire to remove the video direction from between the viewer and the performers so that the live streaming transmissions are on two channels, one directed for video in the conventional manner, the other a wide screen view of the stage. With UHD and a good TV screen the viewer can get an amazing amount of detail from this latter wide screen view. The existing live streaming offering is already using these two feeds, and as well selected performances have a synchronised score transmitted as well. So you can look at the music whilst watching the opera. The new technology has been developed for a live schools programme: Wiener Staatsoper live at school. This enables students to discover the opera house and its many professions, experience live rehearsals, and watch live broadcasts of opera or ballet performances together in the morning during school hours thanks to time-shifted broadcasts. Statistics for the Vienna State Opera are still completely impressive when opera houses everywhere are cutting back. 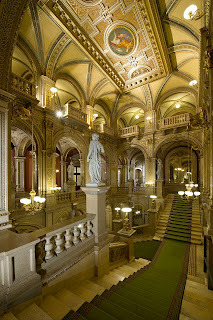 It remains the only major European house to offer a repertoire system which means visitors to Vienna can come for three days and see three different operas. These visitors are important, 33% of seats are sold to visitors and the house has a whopping 99% occupancy rate (with 1700 seats and 600 standing places sold cheaply on the day). This means that some 200,000 people come to Vienna annually for the opera. An important contribution to the city's economy (after all they all stay in hotels and visit restaurants). The company operates a substantial permanent company of some 60 singers which gives it the depth of casting needed to be able to cast repertoire performances. This season there are 54 operas including five new productions, with 234 opera and operetta performances, and 51 ballet evenings. A new production of Verdi's Macbeth has just premiered in Christian Rath's production conducted by Alain Altinoglu. New productions to come include Hansel and Gretel conducted by Christian Thielman, directed by Adrian Noble (a work not performed at the Vienna State Opera since the war), Janacek's Makropoulos Case conducted by Jakub Hrusa, directed be Peter Stein (the first ever production of the opera at the Vienna State Opera, and their first Janacek in Czech), Peter Eotvos' Three Sisters, conducted by the composer and directed by Yuval Sharon, and Gustavo Dudamel conducting Puccini's Turandot, directed by Marco Arturo Marelli with Lise Lindstrom as Turandot and Johan Botha as Calaf. In the repertory revivals, Strauss looms large with Der Rosenkavalier, Salome, Elektra, Ariadne auf Naxos and Arabella. There is also a Ring Cycle (which the Vienna State Opera treats as a repertory piece) plus the major Wagner operas. Whilst there is new opera too, including Thomas Ades The Tempest which was a great success at its Viennese premiere, by and large the repertoire is familiar and Dominque Meyer admits that the majority of visitors come because they know the programme. Because of this large number of performances it has been essential that the filming for the live streaming is seamless and does not invade the performance. The cameras are virtually invisible and remote control. The Live at Home offering does require a specific platform. They are launching on the leading platforms for TV through the internet live broadcasts from Vienna State Opera can be enjoyed and payed for most comfortably on Apple TV, Amazon Fire and Android TV, as well as on SmartTVs from all main manufacturers. In addition they are launch apps on big carrier networks, starting with A1 Austrian Telekom in November, UPC Horizon europewide in March and on TELSTRA for the Asia/Pacific region in April. Which is not much good for those of us who only use Freeview, but is the way that things are going..
Once you have the right box, the costs are not onerous. 15 euros per month or 150 euros per year, with 14 euros for a single ticket. There is an app which enables you to watch on a mobile device, and the time zone can be automatically shifted so that you watch in your own timezone, and only 50% of viewers watch at Vienna live time. They are now seeking partner opera houses to develop a separate brand on the same platform from 2016. You can't beat a live performance and you can get full information on performances from the Vienna State Opera website. 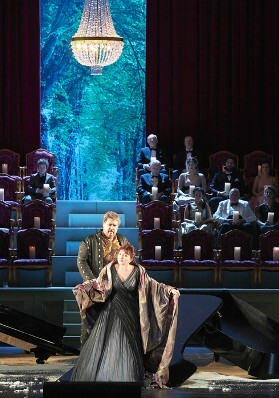 But for those of us who can't pop over to Vienna a will, the Live at Home offering is very tempting; further details can be found at the www.staatsoperlive.com website. Wednesday, 23rd March 2016: ballet: LE CORSAIRE | Legris – Adam u.a.